Sacramento, CA (December 26, 2012) – We are pleased to announce that got sparkles, in association with The Artisan Group, will participate in a luxury celebrity gift lounge hosted by GBK Productions on January 11-12, 2013 at an exclusive location in Beverly Hills, California, in honor of the The 2013 Golden Globe Awards Nominees and Presenters. Our Vine Collection Necklace & Earring Suite will be prominently featured on display at The Artisan Group's exhibit, and all attending celebrities will receive our Vine Collection Earrings in their swag bags. This event will also be attended by nearly fifty press and media outlets. To learn more about got sparkles, our products, or our participation in this exclusive event, visit http://www.gotsparkles.com, call 916-799-9606, or email Kristi@gotsparkles.com. 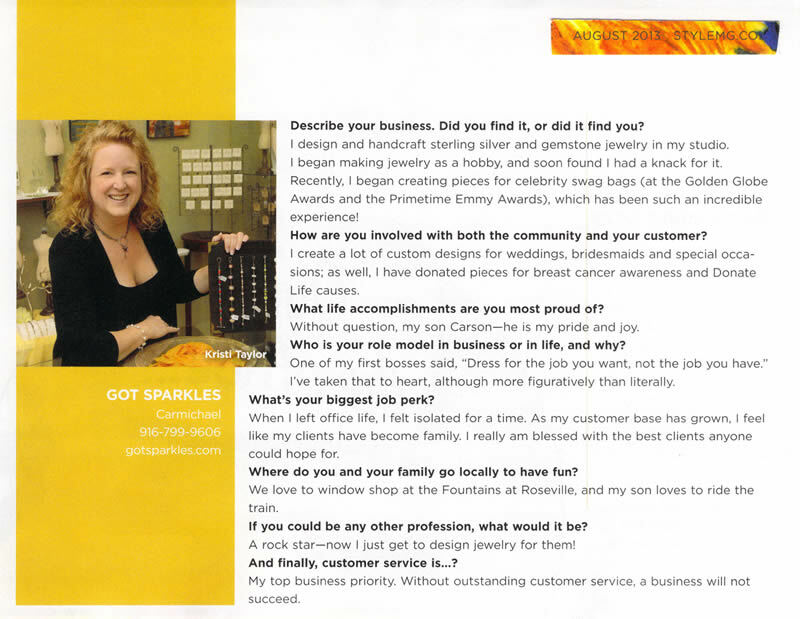 Kristi Taylor, got sparkles’ sole proprietor, is a resident of Carmichael, California and operates her small business out of Sacramento, California. All designs, text & content is the property of got sparkles. Any use without permission constitutes copyright infringement.